WINTERSPORTS – A Spokane nordic skier and his dogs have qualified for the big-leagues of skijoring. 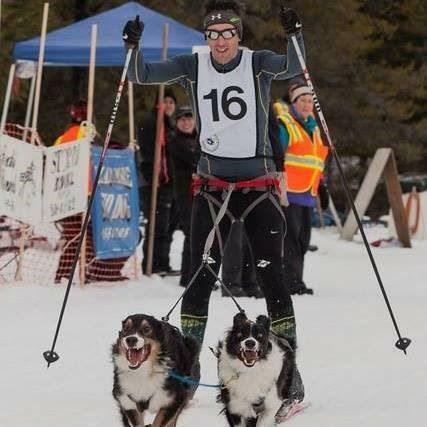 Team Hanks – Louie (Australian shepherd), Lucky (border collie), Mountie (greyster) and Dan Hanks (human) have qualified to compete in the 2017 International Federation of Sleddog Sports World Championships Jan. 23-Feb. 3 in Haliburton, Ontario. Hanks will represent Team USA as he’s towed on his cross-country skis in the 1-dog and 2-dog skijor categories, according to Spokane Nordic Ski Association. National teams of more than 30 countries compete in the World Championships every other year. During the 2015-2016 season Team Hanks competed in six dog-powered sports events resulting in three first-place finishes and three third-place finishes. The performances were highlighted by winning the skijor event in the Priest Lake Sled Dog Race. Hanks and his dogs train at the Mount Spokane State Park nordic skiing area on Wednesday mornings and Sunday afternoons, when harnessed dogs are allowed on specified groomed trails. They also train in the Methow Valley, which has several trails open to skijoring with dogs. “Skijoring is an amazing opportunity to deeply bond with your dog and really learn what it means to fully work together as a team,” Hanks said. More and more athletes are turning to cannicross, bikjoring and skijoring to enjoy exercise with their dogs. Skijoring is dominated by Northern European countries, but teams from the United States are steadily gaining ground. The IFSS website says the organization’s mission is to promote comprehensive development, expansion and participation in sled dog sports in all their diverse aspects, with the ultimate goal of Olympic recognition. Published: Dec. 28, 2016, 6:30 p.m.